Selling inherited stocks can be a hassle. 3. Who Pays the Taxes on Probated Sold Stocks? You can inherit a stock portfolio in a few different ways. You might be the named beneficiary of the deceased’s brokerage account or individual retirement account. 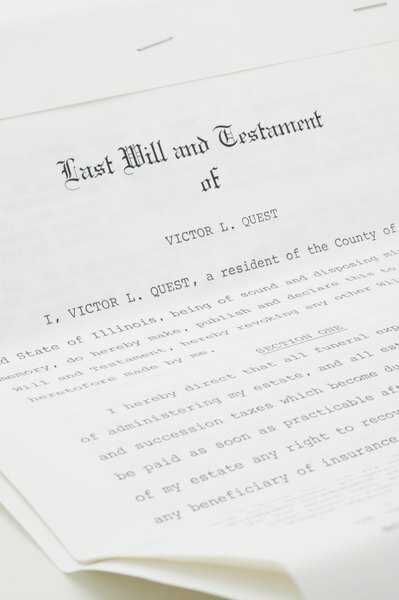 Alternatively, the executor of the deceased’s estate or the probate court may determine that you are to inherit the portfolio. The method of selling your shares depends on how you received them. Stocks inherited from a brokerage account are the easiest to sell, especially if the deceased created a transfer-on-death account naming you as the beneficiary. These accounts don’t pass through probate. You will have to provide the broker with certain documents, including the death certificate and proof of identity. Once the deceased broker is satisfied with your paperwork, it will transfer your stocks to your brokerage account, where you can sell them in your usual manner. Verify that your broker has stepped up the cost basis of the shares it receives. Any shares you inherit receive this step up, which resets the cost basis of the shares to their fair market values as of the deceased’s date of death. Use this basis to figure your capital gains or losses on the sold shares. Always use the long-term capital gains rates to figure the taxes due. You might receive a stock inheritance in the form of stock certificates, which you can sell with the assistance of the estate executor. The probate court gives the executor the right to reassign ownership of the shares to you. Contact the transfer agents for the shares you inherit. A transfer agent is responsible for keeping track of share ownership and of transferring ownership when shares are sold or inherited. The transfer agent will send you forms to complete, including a stock power agreement to reassign ownership. You must sign these at a financial institution that participates in the Medallion Signature Guarantee Program. Transfer agents only accept signed documents guaranteed in the manner. Forward the endorsed shares and other documents to the transfer agents, instructing them to sell the shares. You’ll receive the proceeds either by mail or through bank wire. If you are the beneficiary of an IRA brokerage account containing a stock portfolio, you can roll the account into an “inherited IRA.” This is a special type of IRA registered in the name of the deceased for the benefit of the beneficiary. You can set up the inherited IRA at a brokerage and have it sell the shares for you. You don’t have to distribute all of the money from the sale right away. By using the Internal Revenue Service rules regarding the distributions from inherited IRAs, you can stretch out the distributions (and the taxes on them) for at least five years and possibly longer. You only pay taxes when you remove the money from the IRA. The IRS taxes the distributions as ordinary income. IRAs don’t benefit from a stepped-up basis or capital gains rates. You can dispose of your inherited stocks without selling them. For example, you can contribute them to a charity or to a trust. Qualified charitable gifts are tax-deductible. If you transfer your shares to an irrevocable trust, you can remove them from your estate and reduce estate taxes. Many types of trusts are available and allow you to control the distribution of the shares or the proceeds from the sale of the shares by the trust. If you make an outright gift of the shares to persons other than your spouse, you will use up some of your gift tax exemptions. As of 2013, you can exempt gifts of up to $14,000 a year per recipient from gift tax. In addition, you have a lifetime exemption of $5.25 million. How Do I Sell Stock in an Estate Account? What Happens to Shares of Stock Passed to an Heir Who Does Nothing With Those Shares?